development in 2003 and 2006; (iv) The Community Tourism Award from the Tourism and Hospitality Association of Guyana in 2006; (v) The Community Tourism Award from the Guyana Tourism Authority in 2008; and (vi) The Responsible Tourism Showcase Award from the US Educational Travel Conference (ETC), New Orleans, USA in 2009. Sydney Allicock has been called a hero; some have even suggested he run for President. The respect he commands is no pretence. He has earned it. Even if his work wasn’t done silently – since there was always some recognition of what he was doing in the North Rupununi for the advancement of his people – it was his being named the Public & Civic Contributions 2010 Laureate of the Anthony N. Sabga Awards, that catapulted Sydney into the limelight. He has been hailed as the pioneer of community tourism in Guyana and is held as a visionary Amerindian leader who is not only interested in the economic development of the Amerindian people of the North Rupununi, but he is also deeply involved in ensuring that the Amerindian culture stays alive. 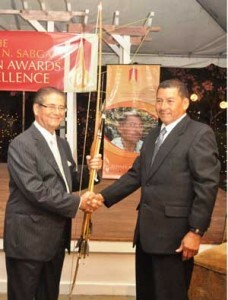 Dr Anthony N. Sabga (left) receives the gift of a Makushi bow-and-arrow from Mr Allicock during a reception in G/town for the 2010 Caribbean Awards Laureate in Public & Civic Contributions. He led the Surama community in implementing a sustainable tourism project that has been copied by other Amerindian communities in Guyana and is considered a model for development of the country’s interior. Surama is located a 30-minute land-rover ride away from Annai, the central administrative district of the communities of the North Rupununi, itself some 420 kilometres (261 miles) from the capital Georgetown. The village of 42 families is as beautiful and impressive as the efforts of the villagers to keep their community intact through tourism, offering visitors an awe-inspiring insight into the jungle and savannah, its wildlife, and their primeval Macushi culture. “The finest park that England boasts falls short of this delightful scene” is how Englishman Charles Waterton described the village writing in “Wanderings in South America” after his stumble upon Surama in 1812. Today, Surama, with its thatched roof cottage houses, sits in a basin circled by the foothills of the imposing Pakaraima Mountains, remaining true to Waterton’s idyllic portrayal. Modern day Surama had its beginning a mere 40 years ago, and just about 15 years after it offered to take care of some college students from Iowa, USA, the village today has emerged as a model for community tourism in Guyana with its conservation efforts drawing considerable attention. And the credit goes to Sydney. Allicock serves as the Executive Director of Surama Eco-Tourism, which employs 70 members of the community as hospitality staff, guides, cooks, artisans, and drivers, or indirectly as farmers, hunters, fishermen, tailors, and maintenance workers. Approximately 60 per cent of the community’s income is now generated through sustainable tourism-related activities, and 75 per cent of Surama’s households derive income from tourism. Sydney relates that when the two groups of students visited in 1996, they asked if the village could prepare meals for them and could find places for them to sleepover. The humble people of Surama agreed, not expecting to be paid for their hospitality, but they were. “You mean you’re paying us?” Sydney remembered the villagers saying, surprised. “They (the visitors) loved the river (Burro Burro) and the forests. They looked at fungi, animals and insects. They loved the jungle walks,” he added. From the two trips of the Iowa students, the community had enough money to set up a guest house. “We didn’t know how to make a guest house. When the visitors came we had them guessing,” Sydney said, laughing. At first, the community only pays its skilled workers, with all other work being done by the villagers voluntarily. Every Monday villagers “volunteer” to work as a village rule and anyone who fails to show up without a reasonable excuse has to pay a fine of $500! Born in the 1950s, Sydney Allicock went to Primary School in the village of Surama but since no secondary school existed, that was the end of his education. This is one of the main reasons he fashioned the innovative Bina Hill Institute and its Youth Training/Youth Learning Centre, which takes in out-of-school youths from the Rupununi region, offering them the kind of opportunity Sydney never had himself. His work in community development, the empowerment of young people and Amerindian women in particular, is unparalleled. The North Rupununi District Development Board, which manages 16 Amerindian communities inhabited by 10% of the country’s total Amerindian population, finding economic opportunities and investing in cultural revival of indigenous languages, is his brainchild. For years, he voluntarily served as the board chairman, and continues to do so today. As Toshao of Annai, Sydney started celebrations for Amerindian Heritage Day which were later adopted as a national event by the Guyana government. Now Amerindian Heritage Day is celebrated in a different village each year, bringing both investment and national attention to indigenous communities around Guyana. 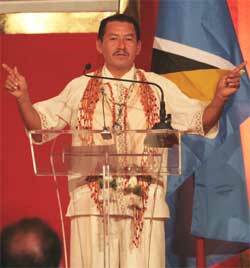 His accomplishments are firmly rooted in his concept of partnerships, and he has consistently promoted the three-legged stool model – that of partnership between the authorities, the Amerindians, and investors. Through his work in Surama, Sydney has stressed conservation. Through community consensus, a 20 square kilometre (12.5 sq. mile) protected area was created by the village. Wildlife trapping and harvesting of endangered tree species are banned, and reforestation and monitoring programmes were introduced. Anecdotal indications show wildlife populations and endangered tree species are rebounding and expanding as a result. Under Sydney Allicock’s leadership, the Surama Cultural Group has been set up. The group motivates and preserves the Makushi culture, especially among the youth. The group composes and performs dances, songs, poems and skits about the Makushi way of life. The cultural group has just released an album of Makushi songs – the first such venture by any Amerindian group in Guyana. In Surama, a women’s cassava-making project supports and showcases the local industry, and the Women’s Activity Centre is a place for craft-making, sewing, embroidery, and for selling the items. Sydney’s contributions to the development of the Makushi people of the Rupununi is unmatched, and he is now a leading voice in Guyana, the Caribbean and internationally for his advocacy in the protection of Amerindian rights and the sustainable use of the natural resources. His professional training has been in the living laboratory of the Guyana rainforest in which his village Surama is nested. His qualifications are expertise in traditional knowledge, affirmation of traditional skills, pride in his ancestry, and turning into contemporary value this rich, centuries-old wisdom and knowledge passed on to him by his ancestors. Today, Sydney serves as one of Iwokrama’s key lecturers and tutors for its Training Services Centre where he has helped train hundreds of young Guyanese, mostly from the local communities in leadership, survival skills and eco-tourism development. He is also one of the Directors of the company that manages Iwokrama’s famous rainforest Canopy Walkway. He has accompanied Mr. Suzuki – of Canadian First Peoples fame – on a speaking tour to various Canadian universities and colleges, and was hosted by Professor Swaminathan of South India, (Iwokrama’s first Director-General) to his world famous programme in the sub-continent where he saw firsthand community institutions and women in particular, who were researching and producing a range of non-timber forest products from their own forests and natural resources, giving him the impetus to weave into the Bina Hill Institute similar efforts. A major contribution has been his leadership in founding and supporting the establishment of the North Rupununi District Development Board (NRDDB). This non-governmental organisation is a milestone in Amerindian social history. The NRDDB serves as the forum for decision-making, information and communication and benefit-sharing for sixteen villages and communities of the North Rupununi. Sydney Allicock currently serves as a member on the Multi-Stakeholder Committee of Guyana’s innovative Low Carbon Development Strategy (LCDS) – where he represents the NRDDB’s sixteen North Rupununi communities. He is committed to the vision of the LCDS and has spearheaded a series of community low carbon consultations. Sydney’s legacy is firmly rooted in the Rupununi and his example and inspiration is for all Guyana.